PC Errors, Crashes and Freezes ? Fix & Speed Up Your PC with RegHunter! Safely repair registry errors and optimize your Windows Registry. Clean up hard drive clutter to increase your PC and Internet speed. Get FREE personalized technical support & updates. If RegHunter can't fix your registry, our technical support team is ready to provide one-on-one assistance with fixing any registry problems. 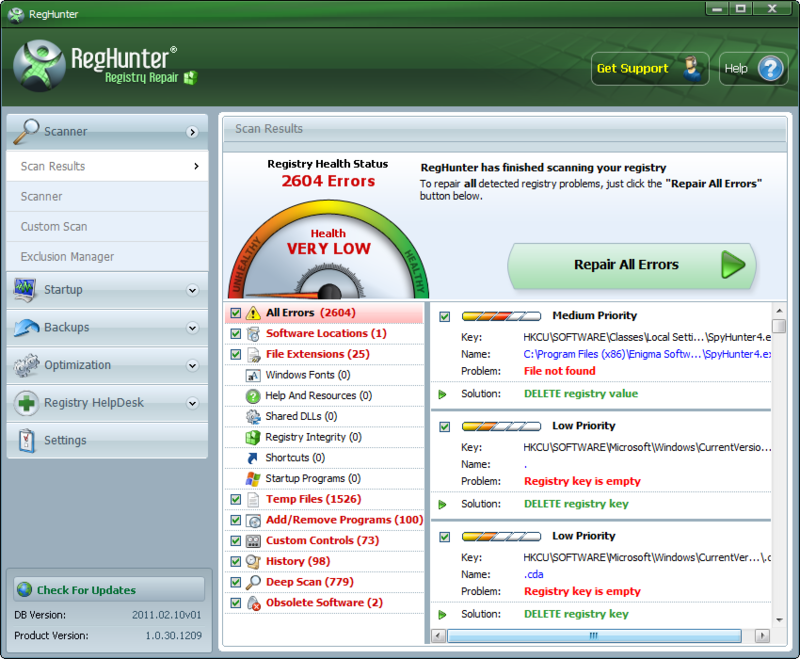 RegHunter gives users an interactive and easy-to-use interface to scan, repair errors and optimize the Windows registry for optimal performance. 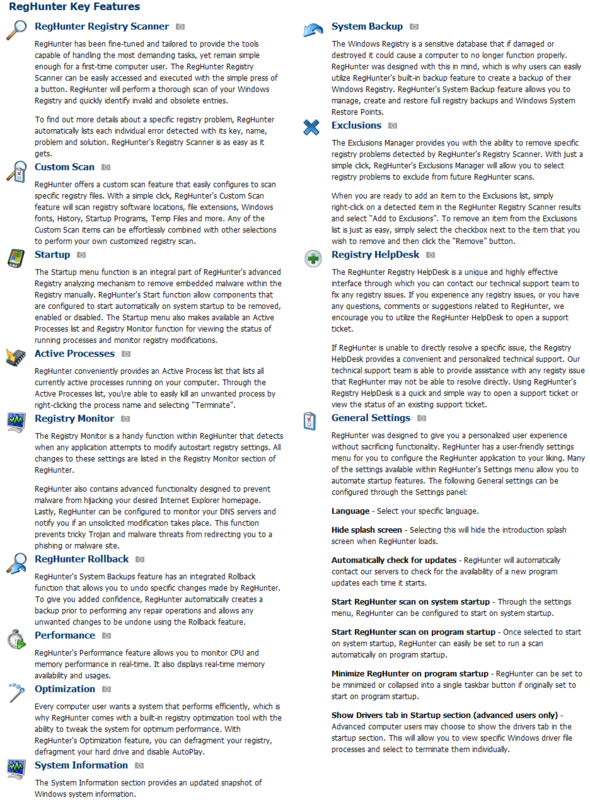 RegHunter includes several helpful integrated tools to cleanup your computer. These include a startup cleaner, disk defragmenter, junk/temp file cleaner, and a wide variety of system optimizers. Get a complete PC tune-up! 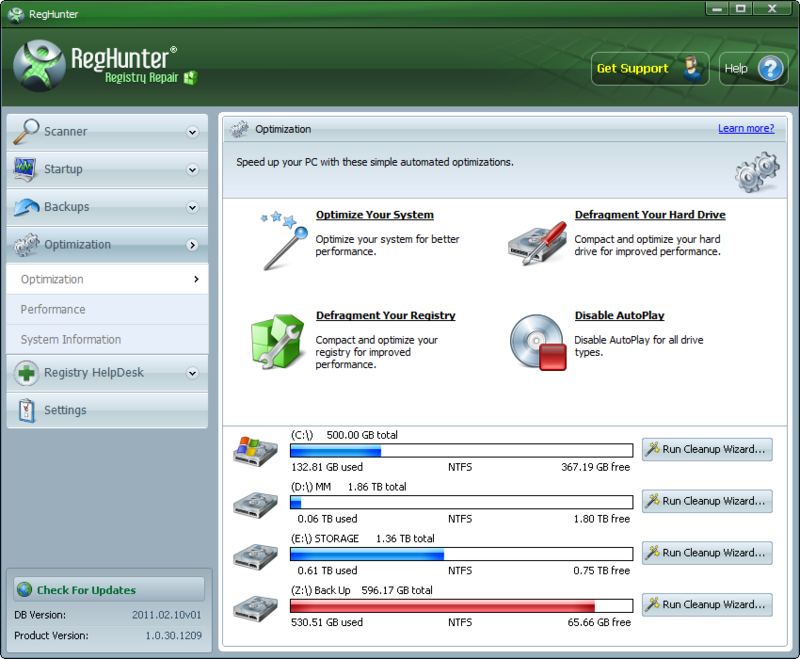 RegHunter's tools and optimizations improve hard drive, Internet connection and general PC performance. The built-in start-up manager can be used to boost system and application performance while speeding up PC start-up time. RegHunter allows you to simply and seamlessly create backups of your Windows registry. If, at any time, you experience any issues and need to restore your registry to an earlier, pristine, state, you can do so with just one click. 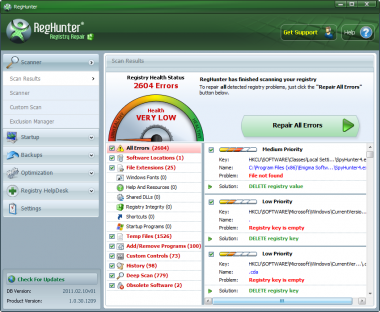 Setting RegHunter apart from other registry cleaners is its exclusive Registry HelpDesk. Through RegHunter's Registry HelpDesk, you will be able to utilize an interactive support tool to communicate directly with expert PC technicians. Custom support tickets can be created to assist you with persistent registry issues specific to your computer. Support tickets will be viewed and sent back to you in a timely manner through RegHunter. If RegHunter is unable to detect and remove a registry problem, you will have the option to create a support ticket and send it to one of our highly trained PC technicians within seconds.